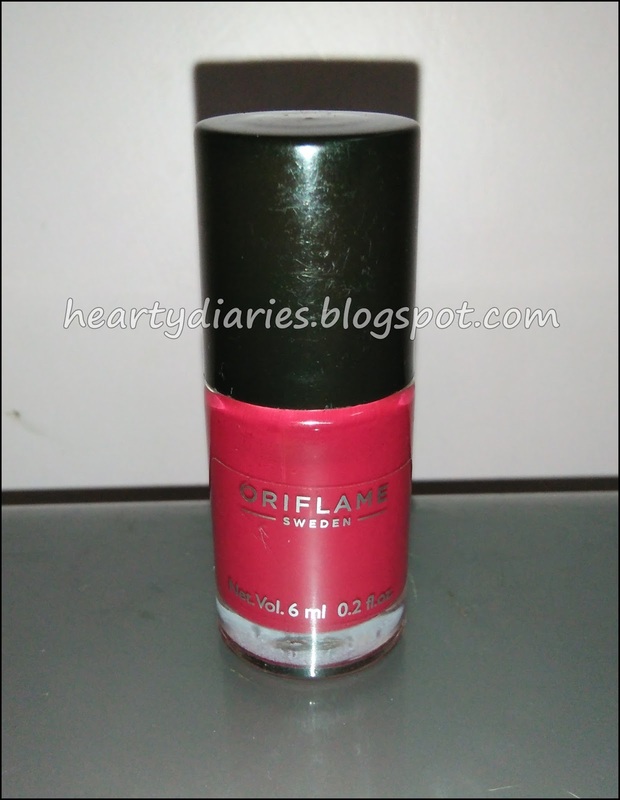 Today I am going to review Oriflame Sweden Pure Colour Nail Polish Mini Review. I bought the shade Ruby Pink with product code 33074 in their entire range. They have 15 colours in their range and I love love love all of them. To check their range with proper knowledge of colours, click here.. So, the product has no claim as such but it has some useful information regarding the manufacturing, product code and shade below the nail polish. Maximum Retail Price: Rs. 189 for 6 ml or 0.2 fl oz. 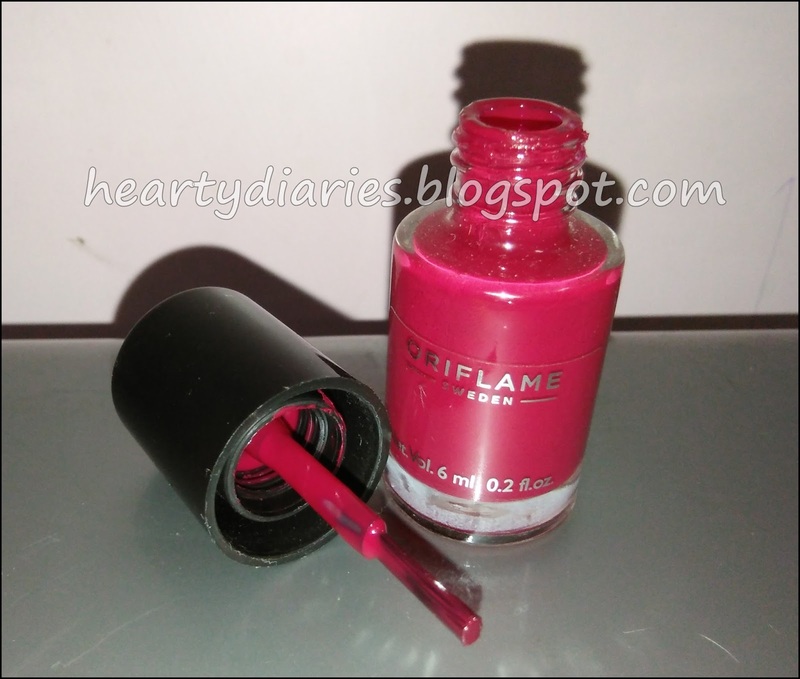 Packaging: The nailpaint comes in a transparent, cylindrical bottle with a black screw cap. 1. The nail polish has a beautiful finish to it. 2. The formula and consistency is very good and thin which helps in gliding it on the nails very easily without any mess. 3. 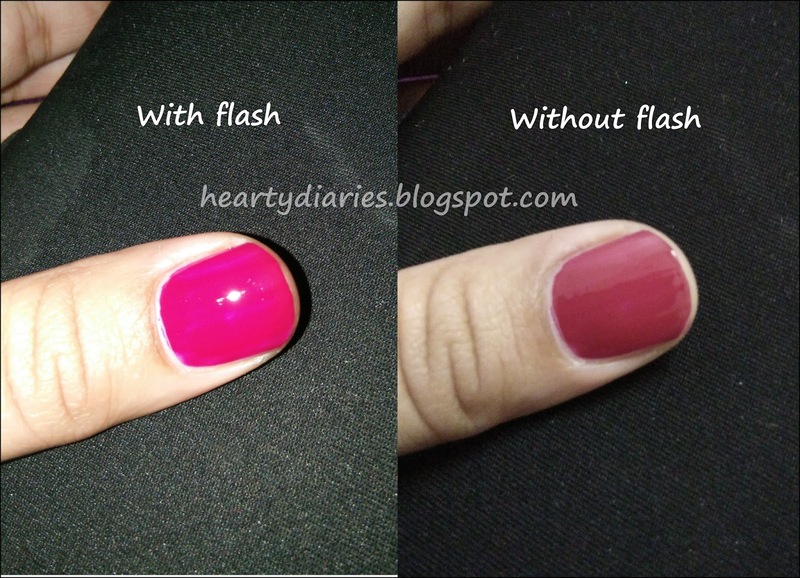 It is so pigmented that even a single coat looks exactly the same as in the bottle. 4. Once the colour is built up by applying two coats, it stays for a long time. 5. The nail polish dries within 30 seconds and you don’t have to sit and let them dry. 6. The finish is gorgeous and little bit on the glossy side though it has no metallicity to it. 7. It is removed easily by a nail polish remover without any colour left. 8. The brush has a very good quality and helps spreading the product on nails evenly without creating different lines. I can find no cons in this product. It has a good formula, good staying power, great pigmentation, dries quickly.. What else do I want? Yes. Definitely. This nail polish is worth it’s price as it fulfils all the expectations of a nail paint lover and has a really amazing formula. Yes. I had always used nailpaints under Rs. 100 before this one but it is after using this particular product that I feel nail polishes are worth spending. The biggest difference I have noticed between this one and the local nail polishes that we get in stores is of the formula. Those nail paints get thicker and messier after a few months but trust me guys, I have this one for about a year now and it is still in the same condition I had bought it in. Yes. I would love to own all the shades in their range. It is such a satisfactory product. It leaves no promises unturned and fulfills all the expectations of its consumer. I just love it and would definitely buy it over and over again until they launch even more awesome ones. Who doesn’t like a nail paint which has a good staying power and doesn’t get thick after a long time too? I wish I can swatch all 15 colours in their range soon. That’s it for today guys. Do let me know which colour you like the most in their range?